F Andrej Šťastný (Vancouver, 2010-11) has been assigned on loan by Slovan Bratislava (Slovakia, KHL) to Dukla Trenčín (Slovakia, Extraliga). This season, he had two goals and two assists in 28 games with Slovan Bratislava. . . .
F Curtis Huppe (Medicine Hat, Lethbridge, Tri-City, 1995-2000) has signed for the rest of this season with the Belfast Giants (Northern Ireland, UK Elite). This season, with the Guildford Flames (England, Premier), he had four goals and an assist in five games. He was released on Nov. 25. 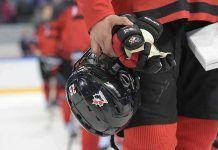 The World Junior Championship hasn’t taken Montreal by storm, even with Canada playing its opening-round games there. Gee, maybe ticket prices have something to do with it. . . . Christopher Curtis of the Montreal Gazette has more right here. Mike Stothers, who spent the previous three seasons as head coach of the Moose Jaw Warriors, will be one of the coaches for the AHL’s All-Star Game. . . . Stothers is in his first season as head coach of the Manchester Monarchs, who are affiliated with the NHL’s Los Angeles Kings. The Monarchs at 22-6-1-1, the best record in the Eastern Conference, which gives the spot to Stothers. . . . The game is scheduled for Utica, N.Y., on Jan. 26. . . . Travis Green, a former assistant GM and assistant coach with the Portland Winterhawks, will be on the Western Conference coaching staff. 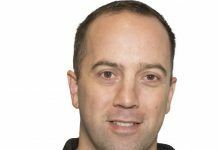 He is in his second season as head coach of the Utica Comets, who are affiliated with the Vancouver Canucks. . . . There’s more right here on Stothers. In Saskatoon, G Nik Amundrud earned his first WHL shutout as the Blades beat the Prince Albert Raiders, 5-0. . . . Amundrud, a 17-year-old from Melfort, Sask., was making his 14th appearance of his freshman season. He made 35 saves. . . . F Sam McKechnie had two goals and an assist for the Blades, with F Nikita Soshnin scoring twice. McKechnie has 12 goals; Soshnin has seven. . . . F Alex Forsberg added a goal, his 12th, and two assists. . . . The Blades (9-25-3) swept the weekend series from the Raiders (16-20-1), having won 6-3 in Prince Albert on Saturday. . . . McKechnie had six points in the sweep. . . . 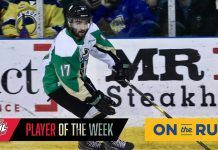 He and linemates Soshnin and Forsberg combined for 16 points in the two games. . . . Daniel Nugent-Bowman of the Saskatoon StarPhoenix has a game story right here. In it, he points out that the Blades had lost 23 straight December games prior to Sunday. . . . In Victoria, G Coleman Vollrath recorded the shutout as the Royals beat the Prince George Cougars, 4-0. . . . 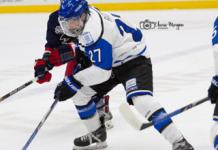 The Royals scored four second-period goals. . . . Vollrath, who stopped 38 shots, has three shutouts this season and four in his career. . . . Victoria F Austin Carroll scored the game’s first two goals, giving him 24. He also had an assist. . . . According to the WHL’s online game sheet, Carroll took a slashing major at 14:02 of the third period. However, the sheet doesn’t indicate an accompanying game misconduct. . . . The Cougars had won 4-3 in Victoria on Saturday. . . . Victoria (18-18-3) had lost its previous five games (0-4-1). . . . The Cougars slipped to 18-19-0. . . . The Royals are second in the B.C. Division, three points ahead of the Cougars. . . . In Brandon, F Rihards Bukarts scored once and added three assists to lead the Wheat Kings to a 4-2 victory over the Moose Jaw Warriors. . . . After drawing an assist on each of Brandon’s first three goals, Bukarts scored an empty-netter at 19:44 of the third period. He’s got 12 goals. . . . Brandon F Jayce Hawryluk broke a 1-1 tie at 14:49 of the second period and D Colton Waltz stretched the lead to 3-1 at 16:06. . . . Hawryluk has 15 goals; Waltz has four. . . . Brandon D Eric Roy had two assists. . . . Brandon G Alex Moodie, making his first home appearance since being acquired from the Saskatoon Blades on Nov. 26, stopped 25 shots. . . . D Dustin Perillat had two assists for the Warriors. . . . The Wheat Kings had beaten the host Warriors 3-0 on Saturday. . . . Brandon (26-7-4) has points in seven straight (4-0-2). . . . Moose Jaw (15-19-3) has lost five straight. . . . In Vancouver, F Scott Eansor broke a 2-2 tie at 17:50 of the third period to give the Seattle Thunderbirds a 3-2 victory over the Giants. . . . The Thunderbirds took a 2-0 lead in the first period on goals by F Lane Pederson, his fifth, and D Ethan Bear, his eighth. . . . F Jackson Houck got Vancouver on the board at 12:25 of the second, with his 13th goal, and F Alex Baer tied it, with his ninth, at 8:28 of the third. . . . Eansor won it with his fifth goal of the season. . . . Seattle G Taran Kozun stopped 33 shots, 12 more than Vancouver‘s Payton Lee. . . . Seattle F Justin Hickman missed on a first-period penalty shot with his side up 2-0. . . . Giants F Vladimir Bobylev had two assists. . . . The Thunderbirds continue to play without F Mathew Barzal (knee). . . . Seattle (16-15-4) has won three in a row. . . . The Giants (16-19-1) went into this one with points in eight straight (7-0-1). . . . The Thunderbirds are fifth in the U.S. Division, but hold down the second wild-card playoff spot. They are three points ahead of the Giants, who are fourth in the B.C. Division, three points behind Prince George. . . . In Calgary, G Wyatt Hoflin tied a franchise record as he backstopped the Kootenay Ice to a 4-3 victory over the Hitmen. . . . Hoflin made his 25th consecutive start, tying the Ice franchise record that was set by Todd Mathews from Jan. 21 through March 14, 2009. . . . Hoflin stopped 34 shots and was named the game’s first start. . . . The Ice scored the game’s first two goals, getting them 45 seconds apart in the first period. F Zak Zborosky scored his 11th on a PP at 10:04, with F Jon Martin adding his fourth at 10:49. . . . 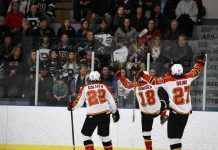 The Hitmen weren’t able to equalize, although they did get to within 2-1 and 3-2. . . . F Adam Tambellini scored twice for Calgary, giving him 21. . . . Kootenay F Levi Cable, who had four goals and an assist on Saturday when the Ice beat the visiting Hitmen 6-2, scored his 16th goal and added an assist. . . . The Ice (20-17-0) has won five in a row. . . . The Hitmen (19-14-3) have lost three straight. . . . The Ice is fourth in the Central Division, but closed to within a point of the Hitmen with the weekend sweep. . . . In Red Deer, F Conner Bleackley scored two goals and added an assist to lead the Rebels to a 3-2 victory over the Edmonton Oil Kings. . . . Edmonton took a 1-0 lead into the third period after F Andrew Koep scored his 10th goal at 10:43 of the second. . . . Bleackley, the Rebels’ captain, scored at 8:44 and 17:45 of the third, giving him 17 goals. He then drew an assist on F Brooks Maxwell’s 10th goal, an empty-netter, at 19:56. . . . Red Deer G Taz Burman stopped 28 shots, two more than Edmonton’s Tristan Jarry. . . . On Saturday, the Rebels (20-13-4) had beaten the Oil Kings (16-16-5) 3-2 in Edmonton. . . . The defending-champion Oil Kings are fifth in the Central Division. They hold down the Eastern Conference’s second wild-card spot at the moment. . . . In Regina, the Pats broke a 1-1 tie with five straight goals as they beat the Swift Current Broncos, 6-1. . . . Regina F Patrick D’Amico broke the tie with his 13th goal at 4:27 of the second period and F Dryden Hunt made it 3-1 with his 13th goal at 8:01. . . . The Broncos had beaten the visiting Pats 5-3 on Saturday. . . . Regina D Colby Williams, playing his second game since returning from a wrist injury, had one assist and was plus-5. . . . The Pats held a 46-24 edge in shots. . . . F Colby Cave scored his 18th goal for the Broncos. . . . Regina D Chase Harrison left in the first period with an undisclosed injury and didn’t return. . . . Regina improved to 21-12-2. . . . The Broncos (18-15-4) had won their previous two games. . . . The Pats are second in the East Division, four points ahead of the Broncos. Regina holds two games in hand. . . . 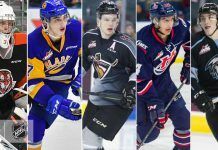 In Portland, F Kailer Yamamoto scored three times to lead the Spokane Chiefs to a 4-3 victory over the Winterhawks. . . . Yamamoto, a 16-year-old freshman from Spokane, has 29 points, including 13 goals, in 31 games. He has 10 points, including six goals, over his last four games. That includes three straight three-point outings. . . . Goals by F Ethan Price, his fourth, and F Paul Bittner, his 15th, gave the Winterhawks a 2-0 lead early in the second period. . . . Yamamoto erased that with goals at 6:14 and 10:19 of the second. . . . Portland F Keegan Iverson got his fifth goal at 14:22 of the second. . . . Yamamoto got that one back at 5:36 of the third. . . . Spokane F Adam Helewka broke the tie at 14:44, getting his 17th goal of the season via the PP. . . . The Chiefs were 2-for-4 on the PP; the Winterhawks were 1-for-4. . . . Spokane G Tyson Verhelst turned in a 45-save performance. . . . Portland G Adam Hill stopped 34 shots. . . . The Chiefs (20-12-3) have won six in a row. . . . Portland (19-16-3) has lost its last two. . . . The Chiefs now are second in the U.S. Division, three points behind Everett and two ahead of Portland. . . .
F Steven Owre scored his 13th goal and had two assists. . . . Cox has 18 points, including 13 assist, over his last four games and has vaulted into the WHL scoring lead. He now leads in assists (48) and points (62). . . . In his last four games, Sanford has 14 points. Actually, those points came in three games as he was pointless when the host Hurricanes beat the Tigers 6-5 on Saturday. . . . Sanford is second in the points derby, with 58, and second in goals, behind only Kelowna F Rourke Chartier, who has 34. . . . Kelowna F Nick Merkley has 56 points, including 46 assists. . . . D Kyle Becker also had a goal, his eighth, and two assists for Medicine Hat on Sunday. . . . Sanford scored his last two goals 1:32 apart early in the third period as the Tigers took a 7-2 lead. . . . F Zane Jones scored his 18th goal for Lethbridge, with F Jamal Watson getting his 16th. . . . Medicine Hat had a 50-17 edge in shots. . . . Ch-ch-ching! There was a four-fight situation at 8:27 of the third period, and it included battling goaltenders. Zac Robidoux of the Hurricanes and the Tigers’ Nick Schneider were tossed from the game at that point. . . . The Tigers, who dressed only 16 skaters, improved to 25-9-2. . . . The Hurricanes (9-21-5) had a three-game winning streak snapped. . . . 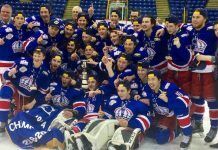 In Kennewick, Wash., F Justin Gutierrez broke a 2-2 tie late in the third period as the Tri-City Americans beat the Everett Silvertips, 3-2. . . . Gutierrez scored his fifth goal of the season at 13:57. . . . Tri-City D Parker Wotherspoon scored his team’s other two goals. He tied the score 1-1 at 12:22 of the first period and 2-2 at 10:22 of the third. He’s got eight goals. . . . The Americans had been 0-14-1 when trailing going into the third period. . . . F Nikita Scherbak scored his 17th goal for Everett. . . . Americans G Evan Sarthou turned aside 28 shots, 10 more than Everett’s Austin Lotz. . . . The Americans (18-16-1) ended a three-game losing skid. . . . The Silvertips (21-10-4) had won two in a row. . . . The Americans are fourth in the U.S. Division, four points behind Portland with three games in hand. For now, Tri-City owns the Western Conference’s first wild-card spot.